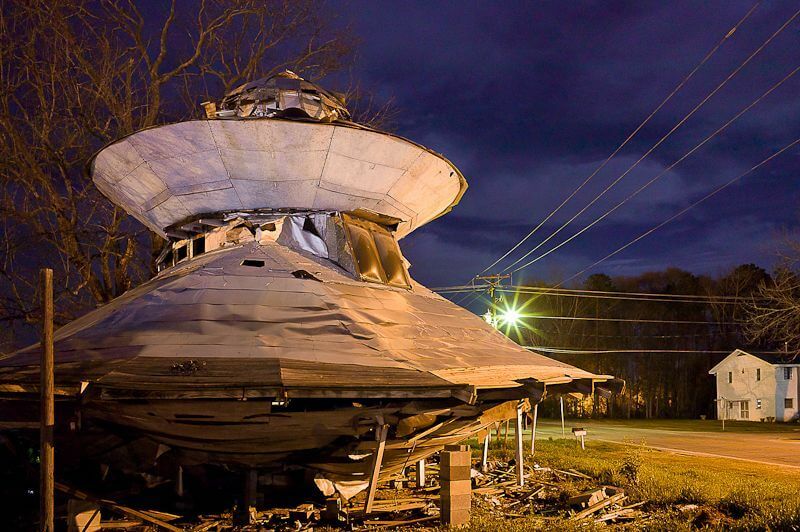 If aliens ever visit our planet, they will find a quiet place to rest in Jody Pendarvis’ homemade UFO Welcome Center in Bowman, South Carolina. Jody Pendarvis is a kooky southern gentleman who has built a ramshackle UFO welcome center in his backyard in rural Bowman, South Carolina. Built to resemble to silver UFO’s stacked behind a scrap metal fence, the welcome center was cobbled together from scrap wood, metal, and random junk. The larger of the makeshift ships is on the bottom of the stack and was built with all the amenities an interstellar traveler might need such as a toilet, shower, television, and air conditioning. The smaller of the ramshackle saucers simply rests atop the other with no connecting bolts. According to aspiring galactic ambassador Pendarvis, this will allow for it to be moved easier by alien technology. This video is long but worth looking at it! The ships look a little rundown these days, but Pendarvis, who stays in the ship when the temperature goes above 55 degrees because it has better AC than his trailer, still holds out hope for alien visitors. Of course, human visitors are allowed to tour the UFO Welcome Center if they are able to reach Pendarvis and pay his ever increasing entry fee. Simply look for the words, “UFO Welcome Center” spray-painted on the fence. If aliens happen to land around Bowman, they’ll be greeted by Jody! I’m not gonna lie—I’ve been wanting to go to the UFO Welcome center for a pretty long time now, at least a year. Finally, on the way home from a meeting in Charleston last Friday, Adam and I were fortunate enough to have some time to take a slight detour to the charming city of Bowman, South Carolina to see it in all its splendor. After taking one look at the UFO Welcome Center, I was convinced that the days of guided tours were over. Supposedly inhabited by a jolly man named Jody Pendarvis, the center welcomes visitors and provides tours. You can get a taste of what the grand tour was like back in 2008 by reading Evan Murphy’s detailed account of his visit, complete with videos and everything. On Friday, though, there was no sign of Jody. The place appeared to be completely abandoned, judging by the amount of debris strewn about and the fact that nobody popped out of the nearest trailer with a shotgun—but what do I know about the sort of atmosphere makes aliens feel the most welcome? After I returned home, I stumbled upon a photo taken in 2009 containing a comparable amount of rubble beneath the saucer, with its jolly inhabitant proudly standing out front, circa May 2009, and this recent report by Roadside America from last summer, which suggests that Jody might still live there. There’s still hope.